Rain over Memorial Day weekend likely means that Missouri farmers will shed planting equipment again for the third weekend in a row. Delays in corn planting have pushed soybean planting progress well below the five-year average. Soybean planting generally does not begin until corn planting is complete. But there is still plenty of time to plant soybean without worries of lower yields, says University of Missouri Extension soybean specialist Bill Wiebold. Eighteen percent of the state’s corn crop remains to be planted, according to the May 18 USDA crop progress report. Soybean planting is 16 percent complete in Missouri, woefully behind this time last year and the five-year average of 27 percent. Last year, 30 percent of the state’s 5 million acres of soybean was in the ground. Row crop planting slowed last week as storms moved through the state. Rain averaged 2.43 inches statewide, with some parts getting up to 5 inches. Wiebold’s studies show that earlier planting and higher yields go hand in hand most years. Soybean yields decrease 4 percent when not planted by mid-May. By the end of May, yields drop by 10 percent. That is significant, but not as important as the long-term damage to soil that working wet fields can cause, Wiebold says. Soil conditions, rather than calendar date, dictate when to plant. The resilient soybean fares better than corn when planted late. “It’s amazing at how good soybean really is at hanging in there,” Wiebold says. Planting date of soybean affects yield less than environmental conditions in August, he says. Conditions during the first two weeks of August govern soybean pod and seed development, which are determinants of yield. Conditions across the state vary greatly. 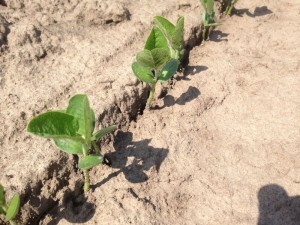 Less soybean has been planted in the western part of the state where heavy rains have hit. Only 7 percent of the soybean crop is planted in northwestern Missouri and only 56 percent of the corn crop there is in the ground. Southwestern Missouri trails at 6 percent of soybean planted, but 94 percent of the corn is planted. Eastern Missouri shows the most progress in soybean planting, with 24 percent planted in the northeast, 23 percent in east-central Missouri and 29 percent in the southeast.